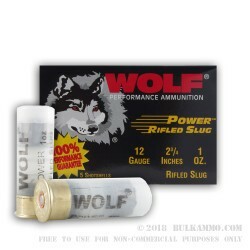 Wolf is offering this foray into rifled slugs in a 1 ounce payload that is well priced and well made. Already a powerhouse manufacturer/importer in the military surplus market, these rifled slug shells for your shotgun offer a new dimension to the WOLF product portfolio. This is a 2 ¾” shell with a solid build quality. 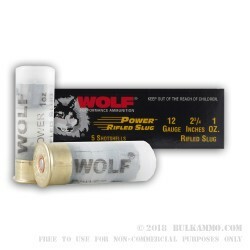 WOLF already has a great reputation in the common calibers for U.S. and Russian platforms and now offering the shotgun loads into the mix makes it easy to justify for consumers because the brand has been providing good reliability for great prices for a long time now. A simple and straightforward load in a translucent hull, the load features a high base build and a solid 438 grain projectile in the form of a rifled slug. This ammunition is not to be used in a rifled barrel. At the price point that these WOLF shotgun slugs are positioned, they are still marginally better priced than peer offerings. 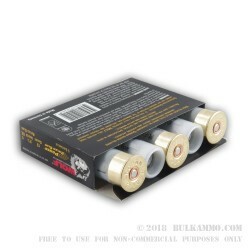 The added benefit of being a managed recoil slug makes these great for practicing and for law enforcement due to the hard, punishing recoil normally associated with slugs. These are also reloadable, but they are priced well enough that the reloading may not be interesting to most.